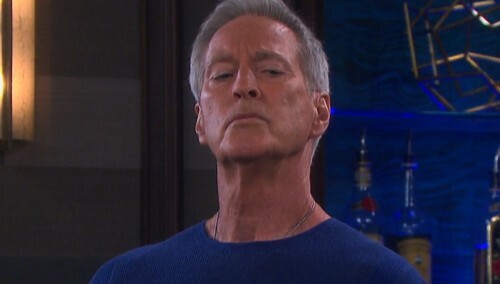 Days of Our Lives (DOOL) spoilers tease that John (Drake Hogestyn) will struggle to keep a shocking secret. 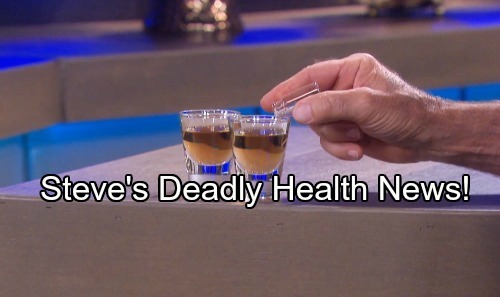 He’s poisoning Steve (Stephen Nichols), but his reasons are complicated. John will certainly feel terrible about what he’s doing to his good friend. He’s known Steve for years and they’ve worked on many cases together. Steve would never suspect John of harming him in a million years. Nevertheless, that’s indeed what John is doing. After drugging Steve’s drink again this week, January 22-26, John will become torn about his dark plan. Days of Our Lives spoilers say Steve will sense that something’s bothering his pal. He’ll ask why John looks so guilty. John will undoubtedly come up with an excuse and shift gears. He might try to lighten the mood so Steve doesn’t get too suspicious. Of course, Marlena (Deidre Hall) may be even harder to deceive. She knows John better than anybody. When John starts exhibiting strange behavior, Marlena’s bound to notice. She’s trained to pick up on personality changes and anything else that’s out of the ordinary. Marlena will likely confront John about why he hasn’t been quite himself lately. Days of Our Lives spoilers state that John will have a decision to make. He’ll almost confess, but he’ll end up backing out at the last second. John will feel like Marlena would be in danger if he told her the truth. It’s possible that someone’s forcing John to harm Steve. He might’ve been blackmailed into this DOOL mess. As for Steve, he’ll finally fill Kayla (Mary Beth Evans) in on the symptoms he’s battling. Kayla will give Steve a checkup, but she won’t see any red flags. She’ll think an eye doctor could offer more info on Steve’s blurry vision. Kayla may think that’s part of why Steve’s been getting so dizzy. During the week of January 29-February 2, Days spoilers say Steve will face a terrible blow. Will his eye doctor reveal that he’s going blind? Could a more thorough medical exam show signs of poisoning? Those are both good options. Either way, Steve will drop a bomb on Kayla and try to figure out his next move. Why would John give Steve something toxic? Can Steve forgive John when the truth is eventually exposed? We’ll give you updates as other Days news comes in. Stick with DOOL and don’t forget to check CDL often for the latest Days of Our Lives spoilers, updates and news. Days of Our Lives Spoilers: JJ’s Story Has Big Emotional Fallout, But Is Theo Really an Innocent Victim?